It isn't that often I get a CD that I just have trouble describing. 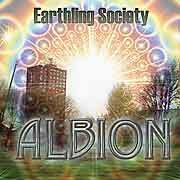 Earthling Society is from England and was formed in 2004. This is their second release. The band sites their influences as Funkadelic, Cosmic Jokers, CAN, Amon Duul and Hawkwind. While the CD bears a small resemblance to these bands, the band creates their own strange space. The CD was recorded in the bands own 8 track studio in the corner of a glass factory. It is a sort of lo-fi sound in some ways, but that adds to the spaced out charm of the music. A number of the songs are built upon strong bass lines after which the guitars and strange sounds are mixed in and around and through the music. This is a CD or LP you have to hear a few times to get sucked into but it is a damn cool world once you enter. For more information you can visit the Earthling Society web site at: http://www.earthlingsociety.co.uk.